The CEO of Gannett’s Detroit business, Dave Hunke, reportedly overcame reservations from GCI business partner William Dean Singleton, in order to reach this historic moment: A high-stakes plan to save the city’s money-losing dailies by abandoning most home delivery. Singleton, CEO of MediaNews Group, wanted Hunke to first run the idea past major advertisers, I’ve been told. Those presentations apparently went well; unless Gannett gets cold feet, an announcement is expected Tuesday. Gannett owns 95% of the Detroit Media Partnership, the joint operating agency that publishes the two papers: Gannett’s Detroit Free Press and The Detroit News, which is owned by MediaNews. The Denver company owns the JOA’s other 5%. Gannett’s Detroit operations early next week will address newly published accounts of a secret project, designed to save the city’s two struggling newspapers. Speculation is focused on a rumored plan to end home delivery of the Detroit Free Press and The Detroit News for all but two or three days a week. This would make the 300,000-circulation Free Press and the 177,000 News by far the biggest U.S. papers yet to drop, or effectively drop, a day’s publication, Editor & Publisher is now reporting. Such a switch, I wrote this morning, would represent an enormous gamble by Gannett and its partner, MediaNews Group, to stanch multimillion-dollar losses in a city whose economy is cratering around the auto industry crisis. Hanging in the balance are the jobs of perhaps 2,000 employees. Wall Street investors weren’t happy: Gannett’s stock plunged 11.9% this afternoon, closing at $7.59 a share, down $1.02. Meanwhile, the widely watched S&P-500 index fell a smaller 2.9%. In a memo regarding a plan reportedly named “Project Griffon,” CEO Dave Hunke said the Detroit Media Partnership has been “exploring various scenarios” to “ensure two strong newspaper voices in the community.” Gannett has controlled 95% of the partnership through a joint operating agreement, reorganized in 2005. Hunke’s memo follows my post this morning, speculating that an announcement on Project Griffon could come as early as Tuesday. Looks like this story has legs after all. That would add even more pressure on the unfolding Detroit drama, where MediaNews Group under CEO William Dean Singleton (left) owns 5% of the Detroit Media Partnership joint operating agency; Gannett owns the rest. MediaNews disagrees with Moodys, and rejects E&P‘s comparison to Tribune. Gannett and MediaNews are also tied together through the Texas-New Mexico Newspapers Partnership. Meanwhile, Gannett is partners with Tribune in two ventures: employment website CareerBuilder, and website entertainment chain Metromix. Martin Langeveld explains why struggling business partner MediaNews Group is unlikely to provide an easy solution to Gannett’s dilemma, by simply abandoning the GCI-controlled joint operating agency that publishes Detroit’s two newspapers. The Gannett-controlled publisher of the Detroit Free Press and The Detroit News is working on something super-duper-secret called “Project Griffon.” It would represent an enormous gamble by Gannett and its partner, MediaNews Group, to stanch multimillion-dollar losses in a city whose economy is cratering around the auto industry crisis. Hanging in the balance are the jobs of perhaps 2,000 employees. Yet with nothing to lose but, well, more losses, the idea is to blow up the traditional newspaper business model in an especially dramatic way. A formal announcement could come as soon as Tuesday — if you believe the speculation. Under the purported plan, one or both Detroit papers would end home delivery entirely, except for perhaps two or three days a week — the more-lucrative Thursday, Friday and Sunday editions. Other days, there would be some sort of slimmed-down single-copy-only version. And everyone would be encouraged to subscribe to already-available electronic editions of the Freep and the News. Stoking speculation: this widely circulating link to a special Freep subscription offer. When prompted for the two-digit access code, type MP and you get one offer; type PM, and you get the offer purportedly available under Project Griffon. 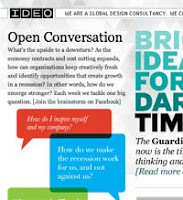 Based in Palo Alto, Calif., IDEO is “an innovation and design firm that uses a human-centered, design-based approach to help organizations in the business, government, education, health care, and social sectors innovate and grow in three ways” — and it just keeps going on and on like that! Now, I can imagine lots of savings on newsprint, presstime and labor (depending on union contracts) for production, and delivery. But how would this affect ad sales, and the size of the ad sales staff? And what other savings would there be? I’ve always thought San Francisco would be the first major American city to lose some or all of its traditional printed newspaper to the Internet; the Hearst-owned San Francisco Chronicle has been on the ropes for years. But that was before General Motors‘ stock lost 84% of its value — in one year. Gannett shares, down 76%, aren’t far behind. Tribune Co., MediaNews Group and McClatchy Co. — all business partners of Gannett’s — gorged on newspaper deals in 2007 and 2006, only to wake up this year with too much debt and not enough income. Plenty of other investors made the same mistake, too, leading to an industry bubble that has now burst. The last big Gannett deal I recall was more than eight years ago, when the company paid $2.6 billion cash to the Pulliam family for The Indianapolis Star and The Arizona Republic, plus four dailies in Indiana and Louisiana. After last August’s big layoff, I told the company’s publishers that employees want to see one thing at the very top of a layoff memo: How many of us will lose our jobs? Sunday on Meet the Press, President-elect Obama talked about the economy getting worse before it gets better. We are making distinct efforts to develop new revenue streams and new clients. Every day we are experiencing wins in those areas and our sales folks are doing impressive things. But it is a big gap to bridge as numerous large and perennial clients cut their spending dramatically. Automotive advertising alone is down by staggering amounts. Most of you are well aware of the expense cuts we’ve made. Your efforts to do more with less, really get behind the Information Center model and to carefully limit overtime have gone a long way to minimize the need to cut positions. Even so, we have eliminated some positions and will likely need to eliminate some more in coming months. For the group of staff who are contracted talent, individually negotiated cuts will be made at the appropriate anniversary of their contracts in 2009. For commissioned sales account executives, cuts will be incorporated into their base pay, but they will be given incentives to overcome those cuts in the categories of new, online and developed business. I’m sure all of you can see that their success in bringing in new clients is our hope for the future and a return to higher salary levels for all. We announce these cuts with the full knowledge that some individuals may find it time to move on in their careers. While we hope that does not happen, it is a risk we must assume in these extraordinary times. This pay cut does not mean we will suspend performance reviews. There are some amazing and appreciated things going on that need to be discussed and celebrated. That individual feedback is more important now than ever. We are hopeful that these cuts will be reversed in future budget years. For the time being, we can only do our very best to remain vital to our viewers, online users, clients and communities. No matter how hard the times become, we are the best positioned of any Maine media company to do just this. If you have any questions on this, please don’t hesitate talking to either of us or your department head. On behalf of your managers, our sincere thanks for all you are doing and will continue to do for our stations’ success. Together we will survive these tough times and thrive in the times that will surely follow. Got a memo on your mind? Post it in the comments section, below. To e-mail confidentially, write gannettblog[at]gmail[dot-com]; see Tipsters Anonymous Policy in the green sidebar. If Scripps loses $15M, what is GCI’s hit in Detroit? To start, surely you saw that E.W. Scripps expects to lose $15 million on the Rocky Mountain News this year, prompting the publisher to put the paper on the auction block today. If that’s the toll in Denver, how much is the Detroit Media Partnership losing on the Detroit Free Press and the other daily in that joint operating agency, The Detroit News? Remember, the Freep was already bleeding a year ago, well before the credit crisis engulfed the U.S. auto industry — right there in the Freep‘s back yard. Detroit’s economy has got to be in worse shape than Denver’s. Gannett has controlled the Detroit JOA since buying the Freep in 2005 from Knight Ridder, then selling the News to MediaNews Group. In Denver, MediaNews owns the Post, which is in a JOA with the Rocky. Blogger Alan Mutter wrote today that MediaNews is the most likely buyer for the Rocky, which would probably then be shut down — giving MediaNews sole control of the Denver market. Is anything like that afoot in Detroit? With Corporate now on a rampage to cut costs anywhere, the Freep and the JOA would be expected to report job reductions in the current layoff, even after buying out 116 employees in July. But we’ve heard nothing yet from Detroit Media Partnership CEO David Hunke, who also is Freep publisher. Ditto for Hunke’s boss, USA Today Publisher Craig Moon. Then a reader pointed me to yesterday’s alternative Metro Times, where columnist Jack Lessenberry notes “persistent rumors have been circulating that the Detroit Free Press was on the verge of publishing mainly on the Internet.” And then there was this curious comment, by Anonymous@7:53 p.m. . . . Earlier: Documents reveal double-digit profit margins at scores of papers now on verge of massive layoffs. Gannett launched what is likely the biggest mass layoff in newspaper industry history yesterday, slashing 863 jobs by early this afternoon, in an increasingly desperate bid to return the troubled 102-year-old publisher to prosperity. The final tally could run into the thousands. Many more layoffs are expected today and tomorrow across the 85-daily community newspaper division, plus USA Today and the Detroit Free Press. As of 1:51 p.m. ET today, only 24 papers had been accounted for, based on published accounts and Gannett Blog reader reports. Some of the biggest worksites have not announced their plans, including The Courier-Journal in Louisville, Ky., and The Des Moines Register, both with about 1,000. Corporate has said the cuts will number “significantly less” than 3,000. Yesterday, in one of the first of scores of memos expected in coming days, Publisher Curtis Riddle of The News Journal in Wilmington, Del., told employees that the paper is cutting 44 jobs — about 7% of all. The reductions include 31 forced layoffs, his memo says. Corporate announced plans for the layoff Oct. 28 — five weeks before they would take effect. Anxiety grew, sending employees hunting for advance word; by late last night, Gannett Blog had recorded about 20,000 visits and 65,000 page views for the day — more than four times normal. Readers also posted more than 750 comments. The job cuts come as papers nationwide complied with Corporate’s demand that they reduce employment by an average 10% in the 30,000-worker newspaper division. The retrenchment follows the loss of 1,100 newspaper jobs in September and August, and the company’s continued earnings erosion. Under growing pressure, CEO Craig Dubow (left) and other top brass face Wall Street media stock analysts next week during a three-day conference that starts Monday. Yesterday, Gannett’s stock closed at $8.68 a share, up 6%. Still, shares have plunged 76% in the past year vs. a 43% decline in the widely watched S&P-500 Index. The job reductions are being made through layoffs, attrition and other means. Many papers will notify employees over the next week. Severance benefits are a minimum of two weeks, and a maximum of 26, plus health insurance as long as severance benefits are in effect. Earlier: Rochester, N.Y., memo is an example of how publishers are breaking the bad news. We’re tallying layoffs and other job cuts, paper-by-paper. Please post your figures on our list, or in the comments section, below. Also please post any publisher’s memos, plus links to your paper’s stories about the cuts. You may also e-mail confidentially via gannettblog[at]gmail[dot-com]. Once more channeling Marie Antoinette, our favorite pampered, multimillionaire media mogul delivers a message to all you whining, soon-to-be laid-off workers: Let them take out mortgages! To be sure, the focus of today’s Neuharth column isn’t the thousands of Gannett employees losing their jobs in the worst economy since the Great Depression. Nor is it about the dozens of workers on the verge of getting walking papers at Neuharth’s own version of Marie Anoinette’s palatial Versailles: the Newseum. Indeed, none of that dreary news is even mentioned! So, what are your kids getting for Christmas? You are currently browsing the archives for the MediaNews Group category.